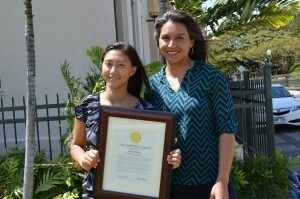 U.S. Rep. Tulsi Gabbard with Kauaʻi teenager Talia Abrams, 16, to recognize her as a youth leader dedicated to creating positive change through her involvement with the community and local government on March 16, 2014. Ms. Abrams took the initiative to author HB2177, which is currently moving through the Hawaiʻi State Legislature and would establish a community food forest program that provides easily accessible sources of healthy food statewide. Kāne‘ohe, Oahu, HI (March 17, 2014) — In recognition of “Women’s History Month,” U.S. Rep. Tulsi Gabbard (HI-02) delivered keynote remarks at Windward Community College’s “Celebrating Women of Character, Courage, and Commitment” event today. Gabbard spoke to a large group of students, faculty, and residents about the legacy of the late U.S. Congresswoman Patsy T. Mink and shared inspiring stories of other female leaders who have selflessly served and continue to elevate the status of women everywhere. Earlier today, the congresswoman met with Kauaʻi teenager Talia Abrams, 16, to recognize her as a youth leader dedicated to creating positive change through her involvement with the community and local government. Ms. Abrams took the initiative to author HB2177, which is currently moving through the Hawaiʻi State Legislature and would establish a community food forest program that provides easily accessible sources of healthy food statewide.